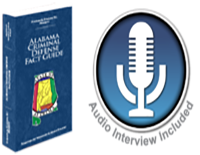 It is critical—when aggressively defending DUI cases in Alabama—to attack all components of the “police evidence” presented against you at trial. First, the initial vehicle stop needs be examined. Did the officer have a legal reason for stopping you? Was there an accident? What were the factors surrounding the initial police/motorist interaction? Does the officer’s justification for stopping you square with Constitutional safeguards guaranteed to you? Next, the roadside investigation need be scrutinized. What was the officer’s reason for having you step out of the car? Did he or she accurately administer the field sobriety tests? When were you placed in custody? What was the environment like surrounding the area you were asked to perform the field sobriety tests? Was a PBT (preliminary breath test) administered to you on the roadside? When? What physical observations did the officer note? Did he or she rely on these observations to place you under arrest for DUI? When did the officer form his or her decision to arrest you? Was it before or after the field sobriety tests? Was it before or after the PBT? How about the Blood Alcohol Test? Which test were you offered? Where was it offered? How long had you been in custody when the BAC test was offered? If you were offered a breath test, were you read the proper implied consent warning? Did you refuse the test? If the police noted a refusal, was it really a refusal? Were all of the administrative rules followed in administering the BAC test? If the breath test was administered to you, was the operator certified? If a blood test was administered, was it done so by a doctor or nurse? Was the blood sample adequately tested? Was the blood sample adequately stored? What type of vial was the blood stored in? These are just examples of a few of many inquires that need be made into the “police evidence” that will be used against you in an attempt to convict you of DUI in Alabama. Below are resource links dealing with some areas of “police evidence”.